Elche is the third largest city in the Valencian community after Valencia and Alicante and with a population of 230,000 it is twentieth in terms of population in Spain. Located on the Southern Costa Blanca, the nearest airport to Elche is Alicante Airport which is just seventeen kilometres or eleven miles away. Elche isn’t so much a tourist resort although the city is very picturesque with over two hundred thousand palm trees, its monuments and museums. Elche is a place very much where people live and work owing to the large number of job opportunities in factories and manufacture. Elche does have its fair share of cheap hotels, villas and apartments for rent, and is less than ten kilometres away from the beaches of Alicante i.e. Urbanes del Sol. Elche is the place to come for a cheap vacation away from the tourist crowds! How much is the taxi fare from Elche to Alicante? Are there coach transfers from Alicante to Elche? What is the nearest Elche airport? Is there a bus from Alicante airport to Elche? Is there a bus from Murcia airport to Elche? How much is a shuttle from Alicante airport to Elche? How much by bus from Alicante airport to Elche? Elche to Alicante how far? How long will it take to travel from Alicante airport to Elche? Is there a train from Alicante to Elche? Elche is a stones throw away from two international airports of Alicante and Murcia with easy motorway links to Torrevieja and Cartagena. 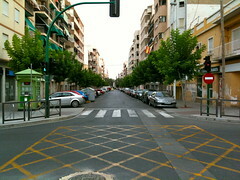 To see the location of Elche or to get driving directions see our dedicated Elche map page. Having arrived at Alicante airport how do you get to Elche and how do you find the cheapest way of getting to your Elche accommodation from Alicante Airport? Alternative transfer options are to fly into Valencia airport which is 155 km to the north with the transfer time of 90 minutes. Also there is Murcia airport which is 140 km to the south but with an equal transfer time of approximately 90 minutes. On arrival at Alicante Airport you can then make your way to the resort by one of the following ways. Taxi from Alicante Airport to Elche: This is the easiest and fastest way to get to Alicante but not the cheapest. The journey time from Alicante Airport to Elche is about twenty minutes depending on traffic. You can expect to pay €35. You can book a taxi in advance on www.radiotaxielche.com. There are unlimited airport taxis at all times of the day (and night) directly outside the doors of the arrivals terminal at Alicante airport. You won’t have to wait around as you would with a bus and it will take you directly outside your hotel, villa or apartment in Elche. Tip – Most taxis from Alicante to Elche only can carry four people. Bus from Alicante Airport to Elche: There is a regular bus service run by Subus going to Elche for €1.25 and a journey time of one hour. There are sixteen services each way daily from Monday through Friday and eight times a day at the weekend and Fiestas. The bus departs daily from Elche bound for Alicante every hour at 05:55 with the last bus departing Elche at 20:55. From Alicante Airport the bus departs at 07:10 every hour until 22:10. At the weekends the buses run every two hours from Elche from 05:55 until 20:55 and from Alicante Airport from 07:10 until 21:10. Private Transfer from Alicante Airport to Elche: There are many shuttle service companies providing transfers from Alicante Airport to Elche. The most popular shuttle companies offering competitive rates include Costa Blanca Transfers, Resort Hoppa and Shuttle Direct. A private transfer with Shuttle Direct costs €12 per person one way for a party of four. A shuttle transfer it’s often cheaper alternative option be getting a taxi from the airport. There are different types of shuttle buses which are shared shuttle buses or private shuttle buses. The size of vehicle varies from small mini-buses to coach transfers to Elche. The more expensive option is to pay £33 per person for a private shuttle bus from Alicante airport to Elche in which you are the only passengers so you are immediately dropped off directly at your chosen accommodation. A private shuttlebus from Murcia airport to Elche will cost £78 per person. A private shuttlebus from Valencia airport to Elche would cost £99 per person. Train from Alicante Airport to Elche: At this moment in time there is no train station at Alicante Airport itself but it is possible to either catch a taxi or take the C6 bus into Downtown Alicante, and then catch the train to Murcia which stops in Elche. For more information about the timetable and prices you can look at the Renfre website. Car hire from Alicante airport is very cheap so it could be a good option even if you don’t intend to use the car much. You can use our Elche map for driving directions to Elche. Car Hire at Alicante Airport: A popular way to get around Elche and the Southern Costa Blanca is to hire a car and all the major car companies are represented at Alicante Airport and you can compare companies to get the cheapest quote. The journey time of course would also be approximately an hour. You can choose to pre book car hire which is a smart thing to do especially during the busy tourist season or organise the car hire after arriving at Alicante Airport. Elche is very much a compact beach resort with usually plenty of Elche bars, restaurants and beaches within walking distance, so unless you want to go on a number of excursions and days out you probably don’t need to consider taking out car hire. Our page on Costa Blanca tourist information will be a big help if you are looking to explore. Elche is a great place to enjoy a holiday especially if one has hired a car, which one can do at the airport or locally. There is much to do and see in Elche and the Northern and Southern Costa Blanca, such as days out at the sea side resorts of Torrevieja and Guardamar del Segura, visit Murcia with its cathedrals, theme parks and shops or venture up north to Benidorm to visit the theme parks of Aqualandia, Terra Mitica, Terra Natura and Mundomar.